So, three years in and now firmly established, a few changes had been made to the layout since last year and, judging by the number of people present, a lot of tickets had been shifted. The bandstand, formerly tucked away in the woods, was now better placed in the food area, giving the smaller acts a guaranteed audience. Replacing this was a new after-hours dance arena manned by the likes of local good guys, Tru Thoughts and Russ Dewberry. Another addition was The Jazz Lounge, where documentaries were shown alongside a couple of Q&As with major artists which included a fascinating hour with trumpeter Ambrose Akinmusire, who spoke passionately and frankly on the perils and pitfalls of over-practising technique and shared his wide knowledge of the true birth of jazz. This was later backed up by a daring set that was progressive and, at times, almost aggressive. On Saturday the carefully curated line-up caused a few tough decisions to be made beginning with the day’s openers: Rag ‘n’ Bone Man on the Main Stage or The Bad Plus Joshua Redman in The Arena tent? We chose the jazz option and, in a well-attended tent, saw a gently-paced set from the Minneapolis trio with guest-collaborator saxophonist Redman. Though mostly comprised of ballads, the set was underpinned by a bunch of dynamos itching to burst forth with short flurries of fury. It ended with drummer Dave King’s woozy blues ‘1979 Semi Finalist’ and a gorgeous performance from the band’s latest album before they jetted off to Spain for an evening gig. 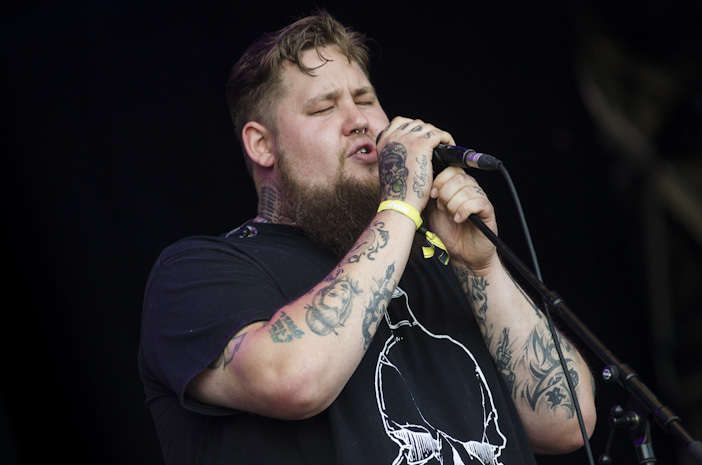 Rag ‘n’ Bone Man’s set was winding down but he had a killer finish with a cover of ‘Shackles (Praise You)’ before being called back for a short solo a cappella encore. With gorgeous weather and a spoilt-for-choice programme it was a real treat wandering from stage to stage catching some mellow Catalan bossa nova from trumpeter/vocalist Andrea Motis, then soaking up Omar’s laidback 70s influenced funky soul set. 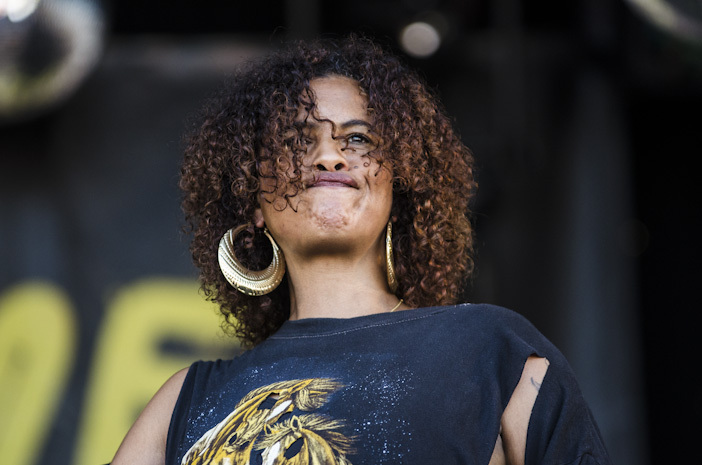 In the absence of Gregory Porter, who had reigned supreme over the first two years of the festival, his crown was there for the taking – and it was royally robbed with both hands by Neneh Cherry. Her performance was just breathtaking and instantly set an unattainably high benchmark for the remaining acts. She was on the form of her life and delivered a set similar to one we heard on her tour of small venues earlier this year. The songs were mostly drawn, like last time, from her collaborations with Rocket Number Nine, who were backing her again today. Bouncing across the stage, her passion was infectious and her charisma inescapable. She spoke of family friend Ornette Coleman’s passing before a spellbinding version of ‘Manchild’ that referenced Pharoah Sanders and ended with a two-act version of ‘Buffalo Stance’. Incredible. Larry Graham also went down a treat with his pimped up suits and distinctive bass (guitar and deep, deep voice) that got the crowd dancing with a selection of soul and funk classics, but which sadly clashed with Dianne Reeves. 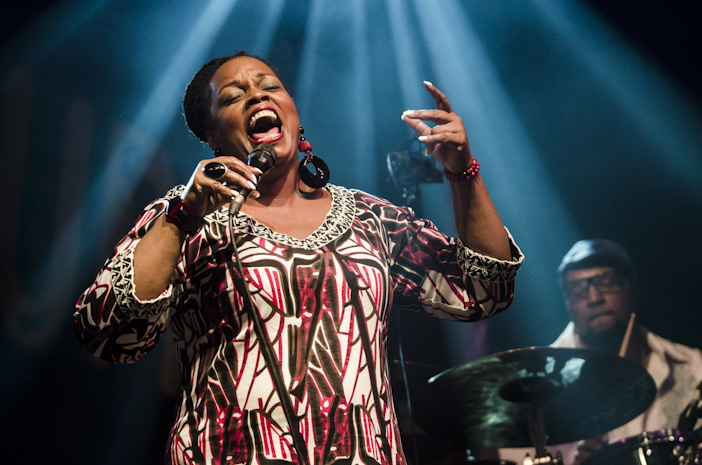 The winner of this year’s Best Jazz Vocal Grammy is a bona fide legend and throughout her show she dazzled with her scatting that ranged from upper register highs to Sarah Vaughan lows. She duetted beautifully with all the members of the group but the bass/vocal chemistry on ‘One For My Baby’ stood out, as did the bouncy ensemble dancehall finish to ‘Wait In Vain’ that closed her too-short set. 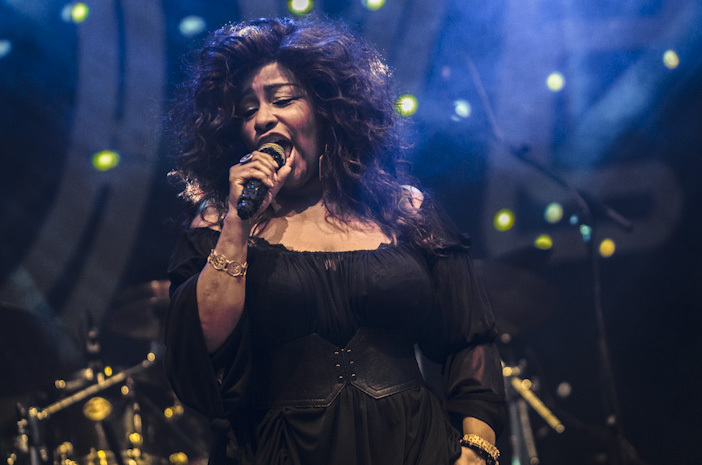 Closing the day was soul legend Chaka Khan whose career-spanning set included 1975’s ‘Sweet Thing’, a slow-burn delight, and a gorgeous rendition of ‘My Funny Valentine’. Unfortunately many people chose to chat over the ballads and an overlong costume change didn’t help but ‘I’m Every Woman’ and ‘Ain’t Nobody’ saved the day. 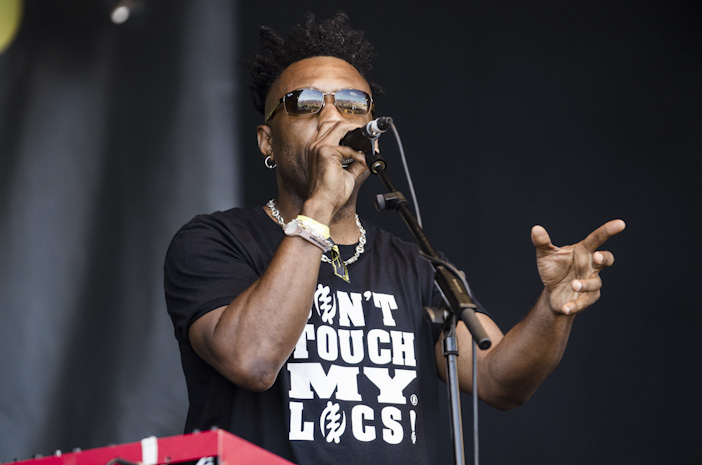 Onto Sunday and after some early traffic problems and poor weather, Jarrod Lawson’s sunshine soul, a contemporary take on the Donny Hathaway/Stevie Wonder 70s sound, gave the crowd a welcome lift. There was even a fly-by marriage proposal during the closing number. Two very different young players followed. Firstly, we enjoyed trumpeter Theo Croker’s hard bop set, expertly delivered by all band members, especially Anthony Williams and his sweeping sax solos. Bassist Eric Wheeler dominated ‘Bo Masekela’, a slow, determined bluesy tribute to the South African master. Then, Taylor McFerrin, who had a similar tone to his father Bobby, but was his own man as he played dancey Rhodes and synths backed only by drummer Marcus Gilmore. Amazing beatboxing skills too. 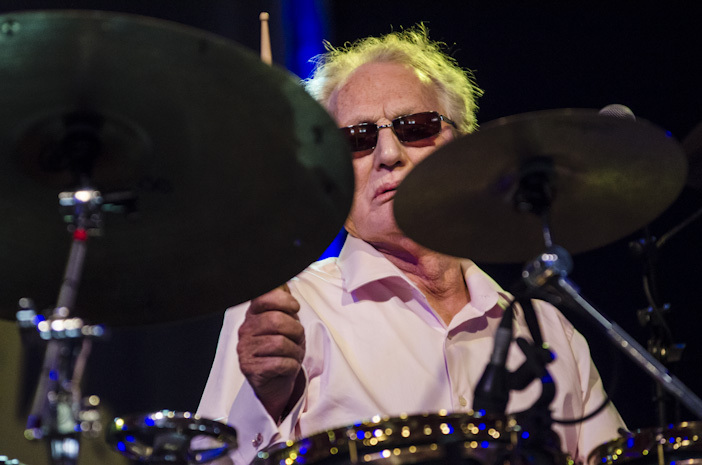 With bandmates of the calibre of Pee Wee Ellis and Alec Dankworth trading bluesy licks, you wouldn’t blame Ginger Baker for taking it easy but he proved his durability on a frenzied tribal finale as he battled it out with percussionist Abbas Dodoo. 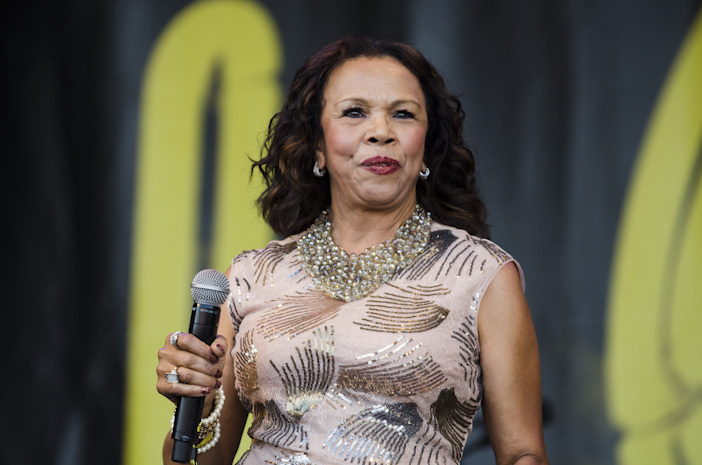 Soul survivor Candi Staton recorded her latest album at Fame Studios and backing band Push faithfully recreated the Muscle Shoals sound on a set of new heartbreakers and 70s classics. 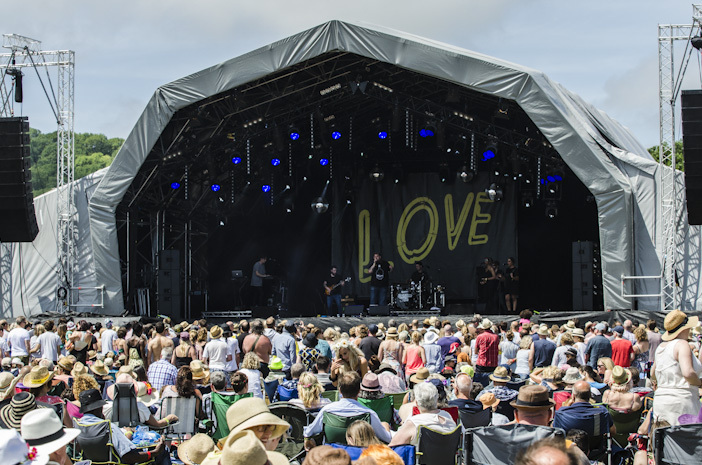 ‘Young Hearts’ and ‘You Got The Love’ had everyone dancing in the sunshine but the biggest cheer was given to the unravelling of backing singer Xavier Barnett’s dreads. 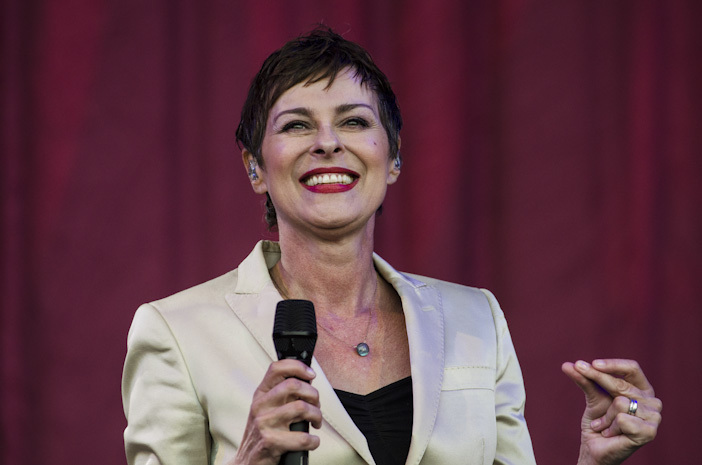 Working class hero Lisa Stansfield supped from a plastic pint glass as she worked through her surprisingly large back catalogue, in fine voice and looking yoga-slim in a vest top. 1990’s ‘People Hold On’ and new Northern Soul flavoured ‘Carry On’ hit the spot before a singalong ‘Around The World’ to finish. 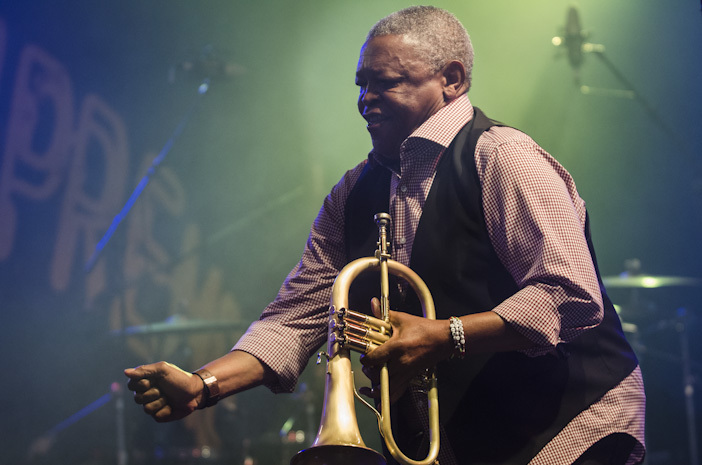 Hugh Masekela caused a mass migration to the Big Top where the South African trumpet legend gave a masterful performance of originals, berated an overkeen photographer and created a euphoric dancing mood that continued next door for Ibibio Sound Machine’s tropical thunder which seemed to ward off the threatening storms. Their melting pot of sounds caused frenzied dancing, not least from vocalist Eno Williams who finished the show writhing on the floor and flailing around the stage. 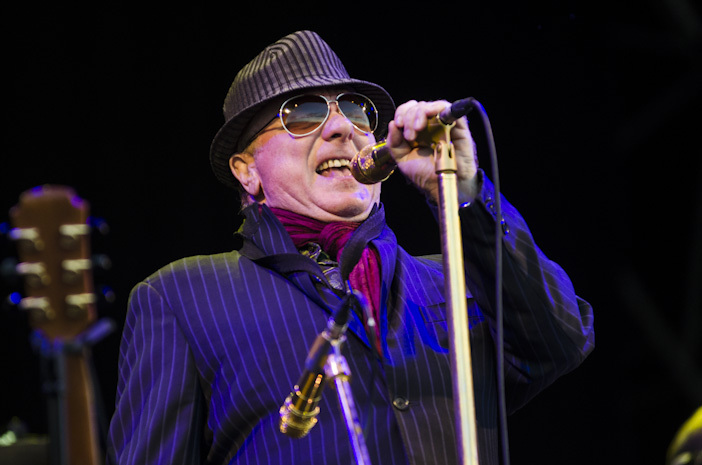 Everyone wanted more but it was into the cold night for the closing numbers from Van Morrison, who wasn’t saying much but, with a tight Booker T sounding band, he didn’t need to. The final live song of the weekend was a rocking, JBs-tinged ‘Gloria’ that successfully concluded another excellent weekend ruled by 80s pop princesses and a new generation of jazz supremos.